For 36 years Turmon Auctions has been building their auction business and are about to present their best auction in company history. On May 5th and 6th they are presenting almost 500 lots of some of the best Western collectibles available at auction this year. They have fine items such as collectible silver bits, spurs, antique firearms, Indian bead work, Western art, early knives, and much more. All pieces sell to the highest bidder on auction day and pre-bids are currently being taken in the online catalog. Turmon Auction Service will also provide an audio and video stream for bidders to watch from their computers during the auction. The first day has a great selection of featured items to bid on. Lot 50A is a great buy on a Winchester rifle. This model is an 1892 25-20 nickel plated marked in the stock, and is a Princess Wenona World Champion shot. The high estimate is only $1200 so this will hammer down for a great buy for the value minded collector. There are 17 Winchester rifles in this day of the sale, and all of them fall within a similar estimate range showing a great achievement by the auctioneer to provide this value at auction. Bidders can search the catalog by keyword for easy access ,and every piece has a photo for inspection. Lots 81 and 83 are to beautiful Native American coats. 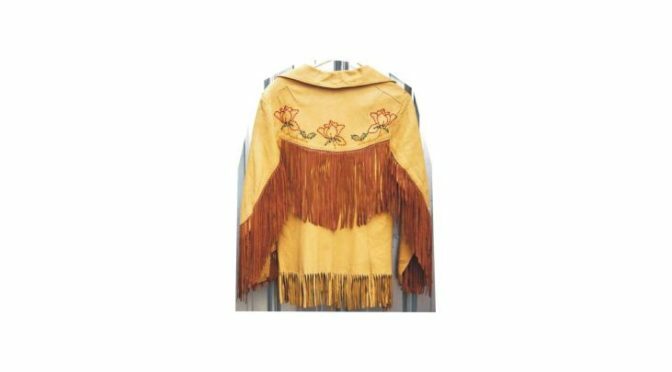 First up for auction is a beaded fringes leather coat. It is stunning to look at is opening for only $75. There are a pair of photos to look at showing the front and the back. Up at Lot 83 is a cowgirl outside split riding coat with a suede vest. This is circa the 1930’s to 1940’s and was purchased at Bohlin Saddlery. It also comes with a Hollywood Sports blouse. Bidders can check out the photo and start bidding at only $100. The biggest highlights of the 2nd day of the auction are a pair of Winchesters at Lot 293 and 294. Coming through the auction block at 293 is a Winchester 1866 octagon barrel .44 rifle. This has a good bore and is all original with factory sling swivels. This is in very nice condition and a highly collectible piece. Opening for bidding at $5000 it is estimated to sell for over $10000 at auction. Lot 294 allows bidders to grab an 1866 .44 saddle ring carbine all original rifle. The bore is pretty good and this Winchester belonged to an Arizona Ranger from Tucson. This one opens for a bit less at $3000, and should sell for a very good price. Wednesday May 5th, 2017 kicks off live bidding at 4:30PM and Thursday May 6th, 2017 opens for bidding at 9AM I the morning Turmon Auction Service is delighted to answer questions about all of their pieces; they have worked hard to consign and build this collection for sale. They can be reached via email or telephone and absentee bidding is currently available. Be part of the live auction on both days and enjoy one of the best traditions in the auction business with Turmon’s Annual Auction.